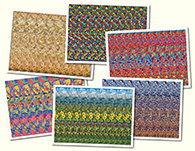 Cross-Eyed Stereogram Gallery : Castle (cross-eyed) : Stereogram Images, Games, Video and Software. All Free! 1. I found these look in front of the screen ones more tiring for my eyes. Still good fun though. Thanks. 4. i was actually looking for a castle which probably explains why I couldn t figure out what the hidden image was. The hidden code is more fun than the real image was. 6. Harder to see definitely but due to the different focusing technique they appear to jump out of the screen. Really nice. 14. I rly like this kind of hidden 3D pic! 20. Mega-cool! And this captcha - fenomenal! br br Too bad I only see cross-eyed ones. 23. Man on the left holding what looks like a bowl and man on the right holding a lance? 25. I can only do cross eyed stereograms. If I do the once where you are supposed to look past the image becomes inverted. 26. I put my finger in front of my face and focused on it then I took my finger away and tried to keep my eyes the same. That s when I saw it! Very nice! 30. What?!?! This one isn t cross eyed!!! 35. 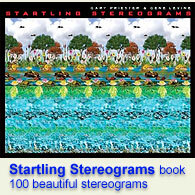 This is literally the best stereogram I ve ever seen. Props to the person who created it.